In today’s modern society, people are beginning to take a look at the world around them and treasure the value that every individual brings to the table. No matter who you are or what you believe in, you have a right to live and love your own way. Individuals who identify with the lesbian, gay, bisexual, trans, and queer community are now seeing big changes in the political and social landscape, pulling back on dated policies and implementing new measures that protect each person’s basic human rights. This is often good news for LGBT couples and individuals who are thinking about adopting a child. Today, there are thousands of adults hoping to grow their loving family while there are thousands more children waiting to be placed with encouraging caregivers. A is 4 Adoption was founded to cut through the red tape and deliver the best outcome for adults going through the adoption process. People going through this process will be let down by the average adoption agency in California. Unlike these facilities, our adoption works to provide the best support for everyone involved, from financial support for pregnant mothers to guidance and education for adoptive parents. We are proud to provide open adoption services to place more children in need into more loving arms. A is 4 Adoption is also a staunch supporter of the LGBT community. We believe that love and compassion are the most important aspects of our jobs, and we provide LGBTQ adoption services to help unite more families. Despite the best efforts of many advocate groups, a lot of misinformation still surrounds LGBT adoption measures. Below are a few myths and facts concerning the matter. If you are thinking about adopting, or you are considering putting your child up for adoption, be sure to reach out to our caring specialists today! Fact: Role models do not need to fit the classic mold. In fact, unadopted children are left with no parental roles and no place to call home. If you are surrounded by loving family and friends, your child will have a large number of figures to model himself or herself after. From teachers and daycare providers to grandparents and neighbors, your kid will likely have a supportive community. If you are concerned about providing proper role modeling, our experts can assist in creating an effective care plan. Myth Two: The best homes for children consist only of a married mother and father. Fact: There are thousands of children in need of loving homes and not enough married straight couples to help every child in need. In fact, our modern adoption system creates a structure where less and less kids are being placed with waiting adults. According to the Adoption Network, there is nearly half a million children in our foster care system, with just over 30 percent actually being adopted. Studies have shown that LGBT households exhibit similar outcomes for adopted children, often with gay or transexual adults providing more resources and support for their expanding family. If you believe that a child should only be with straight, married couples, consider the alternative of having no parents and no home. Myth Three: Gay and lesbian adults are not stable enough to be good parents. Fact: Statistics show that a majority of homosexual adults are in committed relationships. We have received commentary noting that LGBT caregivers are less stable, therefore being unable to provide a safe and supportive household for the adoptee. A is 4 Adoption takes pride in our level of quality with each service we provide, and our experts will perform an extensive background check, numerous house visits, and more to determine the safety of the households we work with. Regardless of your gender or sexual orientation, what is important to us is your commitment to providing a quality life for your new child. The American Psychological Association published a recent study that concluded that there is no evidence found thus far that establishes gay or lesbian parents as disadvantaged when compared to their straight contemporaries. In fact, homosexual parents are just as likely as heterosexual couples to provide the proper level of care and support to encourage a stable, happy life. 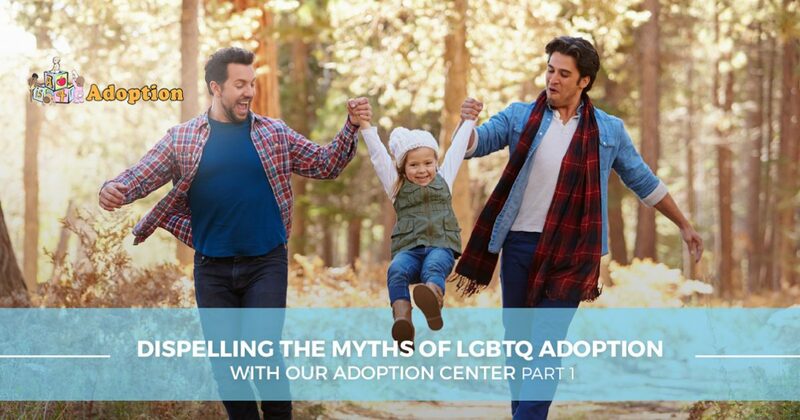 There are a lot of harmful myths surrounding LGBTQ adoption that only serve to further isolate children who are in desperate need of a loving home. Next time, we’ll continue this topic by discussing more myths and the truths to dispel them. If you are thinking about adopting a baby, it’s important to work with professionals who are here to create the best outcome for your family. A is 4 Adoption is proud to be a powerful alternative for any adoption agency in California, delivering comprehensive support to create the best outcome for the child at the center of it all. Contact us today to learn more!